Our outreach efforts are year-round, however, Christmas is a particularly appropriate time to consider the needs of others! There are so many ways to help - but take note of the dates! Many gifts are due SOON so that there is time to distribute them! Please help to make a brighter Christmas for many of our neighbors! On Friday, December 4, at 10:30 a.m., in the St. Paul's parish hall/undercroft, women from the Diocese of Pittsburgh will be packing Christmas boxes for the Seaman's Institute. We need donations of hand lotion, chewing gum, wrapped candy, puzzle books, microwave popcorn, lip balm and paperback books. Items can be brought to the packing party or left in the church office. It will be community work day with lunch provided. Please join us for this wonderful ministry and fellowship opportunity. We are collecting apples, oranges and pears for distribution with the Christmas food baskets. Please add this fresh produce to your regular food donation on the first Sunday in December, which is Sunday, December 6. Puzzled by choices for Christmas outreach? Don't be! But if you want to buy a puzzle to donate to St. Matthew's, Homestead, they would appreciate it! Alice Ursin, who runs an afterschool program at St. Matthew's, has asked for our help in collecting 36 new jigsaw puzzles that are either unisex or for a boy or girl ages 4 through 12. Alice will wrap the games and then tag them appropriately. When Santa visits St. Matthew's, he will distribute them to the children of Homestead served by the afterschool program. Puzzles are due by Monday, December 7. Donate your time - join the Ding-a-Lings and ring bells for the Salvation Army. A group of St. Paul's will once again staff a Salvation Army collection kettle at the South Hills Village Mall on the Saturday after Thanksgiving (November 28). Why not take a break from shopping and join us? 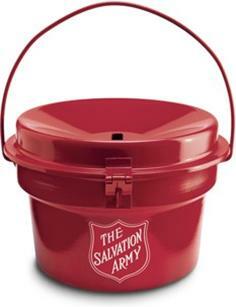 Sign up to ring a bell for an hour and help the Salvation Army provide food and other programs throughout 2016. Michelle has a schedule - sign up for a slot and join us! Tags: Children / Children and Youth / Christmas on the River / Christmas Outreach / Episcopal Church Women / Episcopal Relief and Development / Families / Food Pantry Sunday / Get Involved / Local & National Outreach Projects / Outreach / Serving Our Neighbors / SHIM - South Hills Interfaith Movement / SHIM Angel Emporium / Youth / Welcome to St. Paul's Episcopal Church!